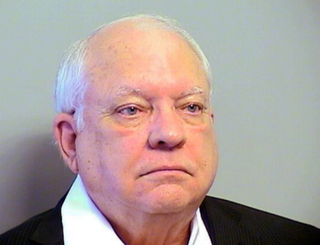 Former Tulsa, Okla., Reserve Deputy Robert C. Bates was not certified to use the .357 Magnum revolver involved in the shooting death of Eric Harris, an unarmed black man. Furthermore, that personal weapon was not on the Tulsa County Sheriff’s Office list of approved weapons, the lawyer for Harris’ family said, according to the Associated Press. Attorney Dan Smolen also stated at a news conference Monday that the Sheriff’s Office failed to keep a permanent record of Bates’ training, which is a violation of local policies. Meanwhile, Tulsa Sheriff Stanley Glanz held his own news conference to defend his volunteer deputy, who is also a friend and the sheriff’s former campaign manager. “Mr. Bates has been to the range several times and is qualified, and that is documented,” Glanz asserted. However, the record on Bates’ firearms training appears to be incomplete and has raised more questions. The Tulsa World reported that Bates’ attorneys released training records that were missing three years of firearms qualifications and nearly all of his required field training. The Sheriff’s Office came under national scrutiny after a video was released of Bates, 73, shooting 44-year-old Harris during an arrest for illegal gun sales. Bates, who now faces second-degree-manslaughter charges, apparently mistook his gun for a Taser. At his news conference, the sheriff apologized to Harris’ family and said that action would be taken against two of his officers—one of whom yelled profanities at Harris while he was on the ground dying. Meanwhile, the FBI says that a civil rights investigation into the shooting is unwarranted, according to the Wall Street Journal (subscription required). “They found no wrongdoing,” Glanz stated at his news conference. However, the agency will take another look if “new information or evidence come to the surface,” the Journal reports.